Owner & Admin: The owner and admin roles remain unchanged. Everything is exactly the same. User: This access level has been eliminated. Everyone who had the user access level now has the extended access level. Extended: A new access level designed for hiring managers that need more power in the system. Extended includes everything that is currently in the user access level plus the ability to see reports. Extended users can see all candidates and jobs, just like users could. 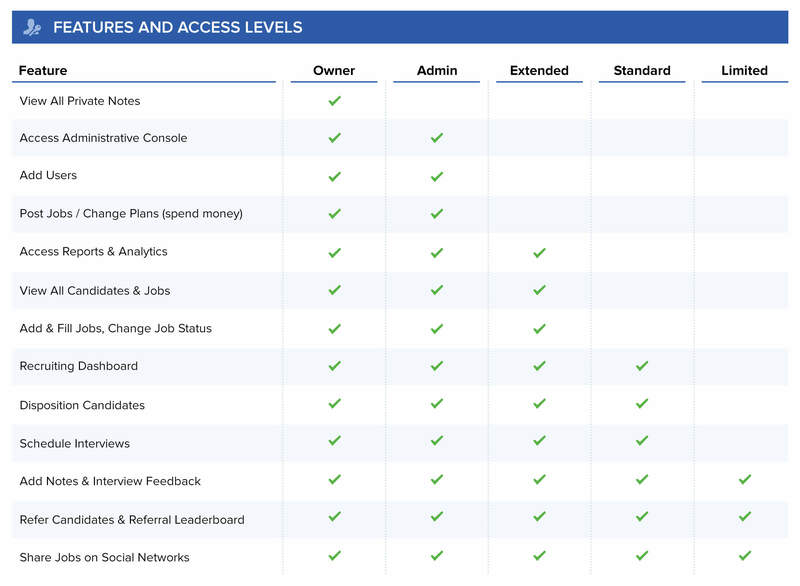 Standard:A new access level designed for hiring managers that should have less power and visibility in the system. Standard users can see candidates assigned to jobs where they are on the hiring team and their referrals, but that’s it. Standard users can see everything for jobs where they are on the hiring team, but just the job description for all other open jobs. Limited: A new access level designed for people who only interview candidates and make referrals. Limited users can only see people who they are scheduled to interview and candidates who they refer. Though access levels have been updated, private notes and private emails have not – everything works the same. All access levels are available on all plans and all plans still include unlimited users – because we want to make it easy for your entire team to use JobScore. Need even more control over who can see what in JobScore? In a few weeks time we will launch “confidential fields” which will allow you to control which Extended and Standard users can see confidential information (e.g. compensation requirements and salary bands) for specific jobs. For now, only people with the Owner & Admin Access levels can access confidential information.